It was next to impossible to get Maggie to co-operate! This was taken on our walk after anchoring in Becher Bay, near Sooke. Wonderful waterfront park for everyone to enjoy, with a beautiful sandy beach and lots of hiking trails and even some petroglyphs to have a look at. Splendid Mane at anchor with the Olympic Peninsula Mountains of Washington State in the background. I am playing catch up on our few last days out on the water. We arrive home last Thursday afternoon. We left Port San Juan on Tuesday morning and motored about 30 miles to Becher Bay, catching another coho along the way. For the most part, the fog had left us alone, but we did not have enough wind to fill our sails. Oh well, Maggie and I enjoyed the day! We anchored Monday night (Aug 12) in Port San Juan after motoring most of the day in pea soup fog. As we approached our anchorage, the fog started to lift (and we caught another coho). We watched as the fog rolled into the bay and hit the sides, but it never came close to us again. I know, I know.... I wasn't going to make this trip all about Miss Maggie, but seriously, how can you not just love that face?!? She is waiting for her share of the salmon we just caught. Maggie likes fresh salmon, raw or cooked, but she doesn't like white fish such as rock cod or ling cod. And she doesn't like crab either. Go figure! When we catch a fish, she absolutely goes BONKERS, and tries to help us by biting and licking the fish once we get it in the net. Way too funny! Fog just moving in while we were anchored in Quait Bay. Well, today is Monday August 12th and we are just leaving Bamfield. Our original plan was to head out on Saturday but the wind decided to do an about turn. So we headed over to Bamfield and hooked up with Rick and Rosita. Yesterday Rick took us out fishing on his FAST boat and we hauled in 8 beautiful coho, 4 for each of Jerry and I!! It was unbelievably fun, especially when we scored two double headers, that is two fish on at the same time, and we landed all of them. So, we are on our way home, today will be a long day, we might make it almost to Victoria and if not we will be in Port Renfrew tonight. This is a photo of fog moving in from the Pacific, hitting an island and then curling back on itself. On this particular day, it was the only fog. Yesterday we motored in fog for most of the day but just before we anchored it cleared off and we had beautiful sunshine. One of our favourite places to anchor in Barkley Sound is behind Refuge Island, close to Lucky Creek. The water temperature was a pleasant 19 degrees (68 fahrenheit) in the bay and just a little cooler in the river. So we all enjoyed a fresh water bath, including Maggie. Trying our luck at catching some fish today! One of the most common features of the west coast of Vancouver Island in August is the prevalence of fog. It is not fun to move around in for obvious reasons. Right now we are having a thick blanket of fog off the coast, so we are going to sit here near Tofino and see how the day shapes up tomorrow. Back from the wilderness of the west coast. We have arrived in East Clayoquot Sound, not too far from Tofino, which is why we have internet now! Our travels for the last two weeks have been AWESOME! We have enjoyed some great sailing, rounding Brooks Peninsula in 38 knots of wind! We are catching salmon, rock cod and lots of crab (no prawns yet!). We've seen humpbacks, lots of sea otters, black bears and heard the lonely howl of wolves (first time ever!). Some of our anchorages have had surprisingly warm water and we have done a fair bit of swimming. The picture above is of a beautiful pool with waterfall close to our anchorage on the north side of Brooks. That water was too cold to swim, but wading was very refreshing. Over the next few days, I will be able to post quite a bit since we will have internet for the most part from here on in. Tomorrow we will probably make a run for Barkley Sound and the Broken Islands. 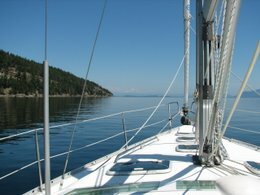 The winds are suppose to be blowing from the NW which is perfect for a sail into Ukee. Full moon over Brooks Peninsula.